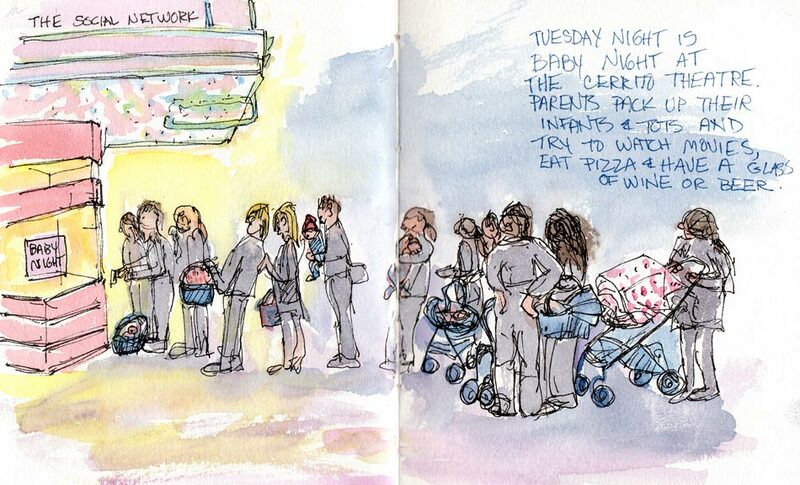 Before we met the others at Nong Thon on Tuesday night, Cathy and I sketched in the dark outside the restaurant by the Cerrito theater and El Cerrito Yoga. Tuesday night is baby night at the theatre and families lined up, loaded down with babies and baby gear, to see the Social Network. The Cerrito serves beer, wine and pizza (along with usual movie fare) while you watch the movie. We could see into the warmly lit, crowded yoga studio and did some quick gesture drawings. This is one of those Bikram yoga studios where they say they crank up the heat to “increase flexibility and flush toxins.” I’m not sure I’d enjoy spending the evening in a crowded room full of people sweating out their toxins, whatever “toxins” are. I know some people swear by sweating, fasting, or colonics to get rid of “toxins” and I wondered if there is any scientific evidence that tells what these toxins are and why releasing body fluids would get rid of them. I found this great article that scientifically (and hilariously) debunks the whole concept, as does this one on Wikipedia. Can you possibly do an entire series on Yoga poses? They will look magnifique!! OK, having tried the hot yoga thing, Jana, I can assure you that your instincts about this are right on the money. Unless you think nausea and headaches are just part of the fun. But nice sketches! Perhaps you should try “hot yoga” before you make your sarcastic assumptions. I do Bikram Yoga because it makes me feel great. I stretch all of my muscles, and after a 90 minute class I feel relaxed, calm and yet energized. It puts me in an amazing mood. Yes, there are claims that it “detoxifies” you, but that is not why I go. I go because it makes me feel good. And it’s helped heal many people of back and other musculature problems. Maybe you should try it before you sling your arrows at it.